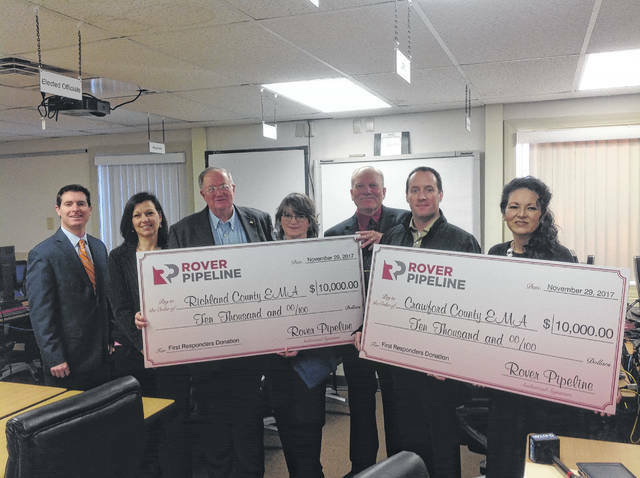 MANSFIELD — Rover Pipeline presented $10,000 checks to Crawford and Richland County Emergency Management Agencies last week as part of its overall commitment to donate $180,000 to 18 Ohio counties. The check presentation was Nov. 29, at the Richland County Emergency Operations Center in Mansfield. Rover is presenting checks to the Emergency Management Associations in the counties through which the pipelines pass. The company has has long stated it is committed to being a good neighbor, a good business partner and a valued member of the communities. Rover Pipeline will make similar donations to county emergency management agencies across the four-state route — totaling $270,000 — in Ohio, Michigan, West Virginia and Pennsylvania. “Richland County plans to use the donation toward the purchase of emergency equipment and training to support emergency operations in the county,” said Mike Bailey, director of the Richland County Emergency Management Agency. Crawford County is still determining how their agency will use the funds. Richland and Crawford counties include a combined 70 miles of the 713-mile project. One of the pipeline’s main compressor stations is in Chatfield Township in Crawford County. Additionally, Rover has donated $250,000 to Ohio’s State Historic Preservation Office, which will fund efforts to educate the public on the history and culture of Ohio in the communities through which the pipeline will be constructed and operated. Rover also has agreed to pay the preservation office $1.5 million under a Memorandum of Understanding signed in February 2017 to help preserve, fund and protect Ohio’s historic cultural resources. This money is in addition to the $2.3 million already contributed to the office, bringing the total contribution to more than $4 million. Currently, the Rover Pipeline is more than 95 percent complete. Phase 1A — from Cadiz Township to the Defiance Compressor Station — began operation on August 31, 2017. The full line is anticipated to be in service by the end of the first quarter of 2018.